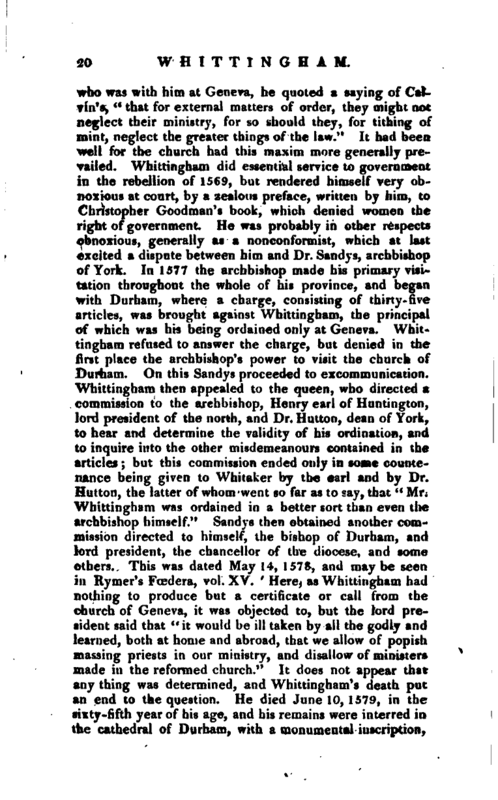 , the puritan dean of Durham, the son of William Whittingham, esq. 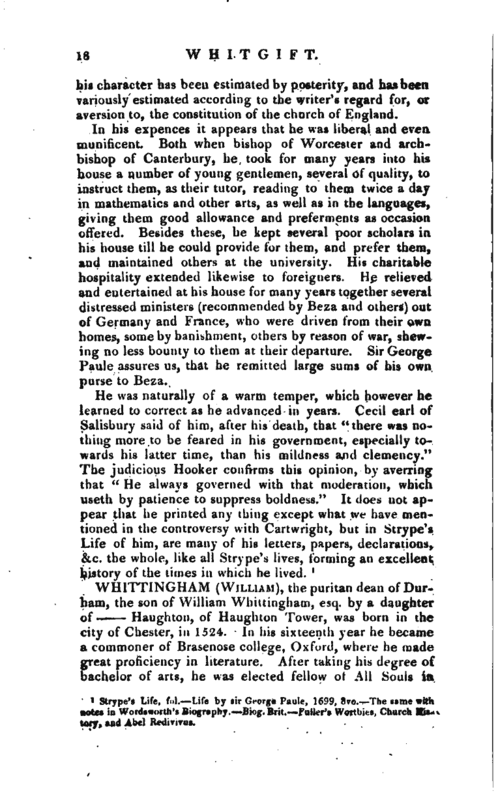 by a daughter of Haughton, of Haughton Tower, was born in the city of Chester, in 1524. 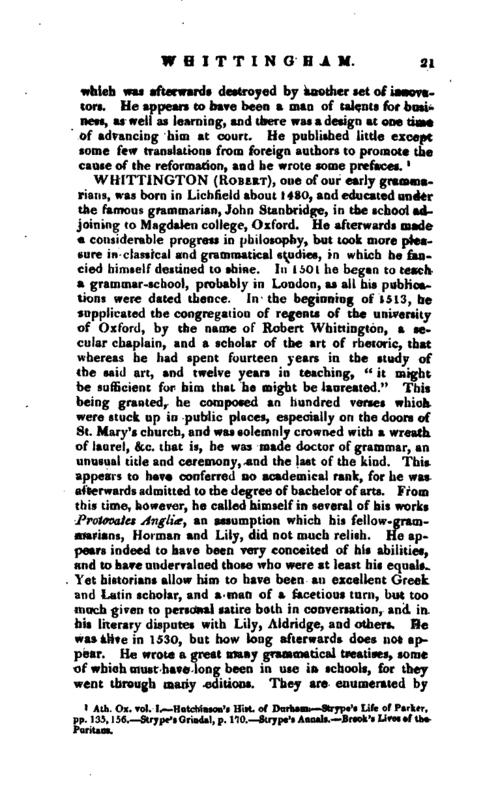 In his sixteenth year he became a commoner of Brasenose college, Oxford, where he made great proficiency in literature. After taking his degree of bachelor of arts, he was elected fellow of All Souls in | 1545, and two years afterwards was made one of the seniors of Christ-church, on the foundation oi Henry VIII. In May 1550, having obtained leave to travel for three yearsj he passed his time principally at Orleans, where he married the sister of Calvin. He returned to England in the latter end of the reign of Edward VI. but, as he was a staunch adherent to the doctrines of the reformation, he found it necessary to leave home, when queen Mary came to the throne, and joined the exiles at Francfort. 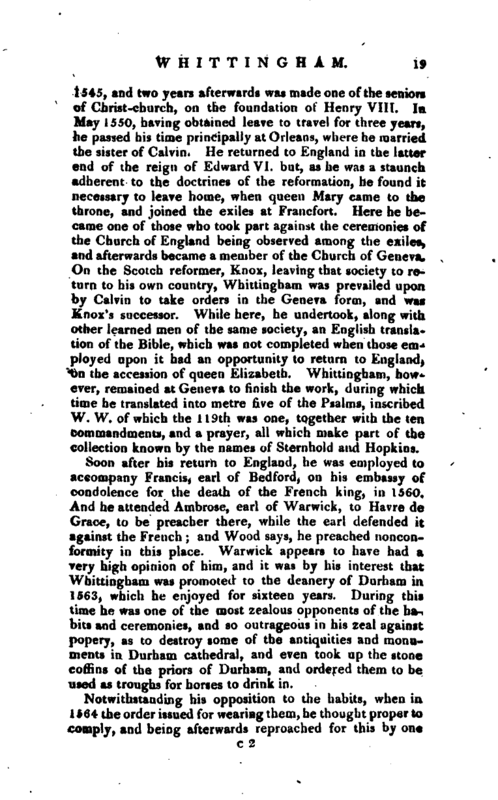 Here he became one of those who took part against the ceremonies of the Church of England being observed among the exiles, and afterwards became a member of the Church of Geneva. On the Scotch reformer, Knox, leaving that society to return to his own country, Whittingham was prevailed upon by Calvin to take orders in the Geneva form, and was Knox’s successor. While here, he undertook, along with other learned men of the same society, an English translation of the Bible, which was not completed when those employed upon it had an opportunity to return to England, on the accession of queen Elizabeth. Whittingham, however, remained at Geneva to finish the work, during which time he translated into metre five of the Psalms, inscribed W. W. of which the 119th was one, together with the ten commandments, and a prayer, all which make part of the collection known by the names of Sternhold and Hopkins. Soon after his return to England, he was employed to accompany Francis, earl of Bedford, on his embassy of condolence for the death of the French king, in 1560. And he attended Ambrose, earl of Warwick, to Havre de Grace, to be preacher there, while the earl defended it against the French; and Wood says, he preached nonconformity in this place. Warwick appears to have had a very high opinion of him, and it was by his interest that Whittingham was promoted to the deanery of Durham in 1563, which he enjoyed for sixteen‘ years. During this time he was one of the most zealous opponents of the habits and ceremonies, and so outrageous in his zeal against popery, as to destroy some of the antiquities and monuments in Durham cathedral, and even took up the stone coffins of the priors of Durham, and ordered them to be used as troughs for horses to drink in. Ath. Ox. vol. I. Hutchinson’s Hist, of Durham. —Strype’s Life of Parker, pp. 135, 156. —Strype’s Grindal, p. no. —Strype’s Annals. Brook’s Lives of the Puritans.